Editor's note: For those of you new to the blog, this kind of post--schematic breakdowns and film review--is the primary content. There are a number of these posts every week discussing the interesting/awesome/depressing offensive and defensive plays from the previous week. 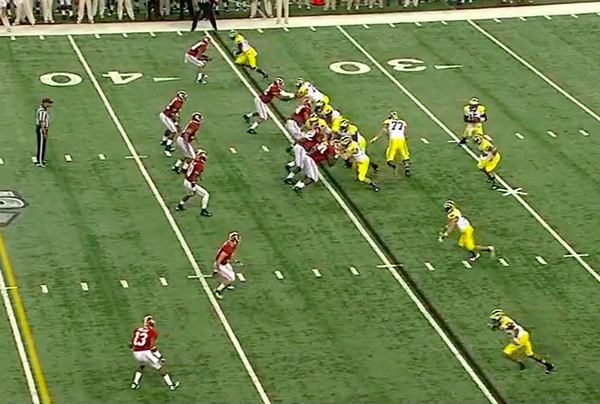 Also a hat tip to MGoVideo for being my primary source for downloads. And a belated hat tip to reader Tony Sinicropi for directing me to the cheapest place to buy the Adobe suite. The amount of criticism Vincent Smith received after Saturday's loss seemed misdirected. People complained that he didn't break enough tackles or make yards after contact, but it's hard to do that when you're a 5'7" running back and you're being pulverized by defensive linemen. After watching the first half of the game again--boy, it's hard to watch more than that--one thing stuck out: Michael Schofield (Michigan's new right tackle) was absolutely dominated all game, which was one of the reasons the team had so much trouble running the ball. As the ball is snapped, Taylor Lewan (#77) begins to pull around to the weakside of the formation as Denard steps to the strongside. 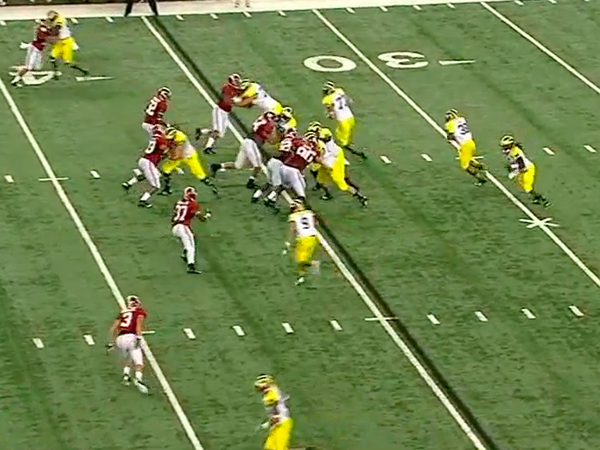 A moment later, Denard hands the ball off to Rawls. 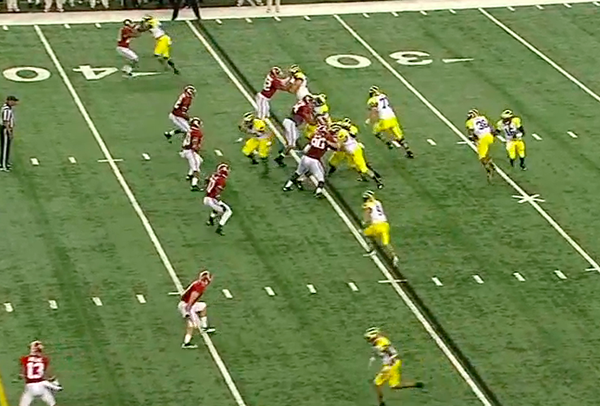 At this point, Michigan actually has the play set up well: the offensive linemen are holding their blocks, Elliott Mealer has released to the second level to block the middle linebacker, and Lewan is pulling to block the weakside linebacker. 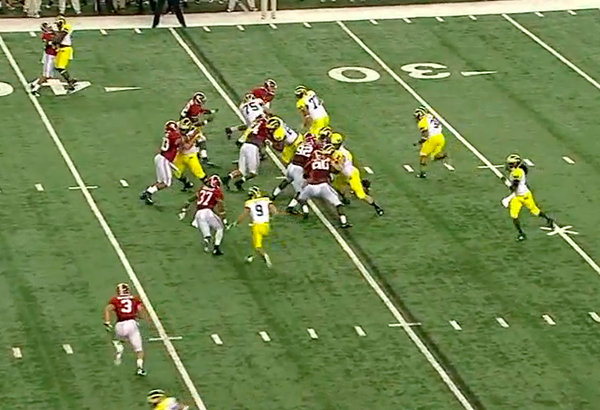 If all of these blocks hold up, the first person to touch Rawls should be an Alabama safety. 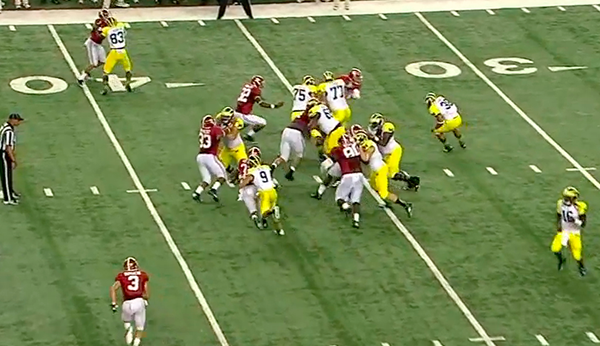 ...Alabama's weakside defensive end has thrown Schofield (#75) aside. Now, instead of Lewan getting to the second level to block the WILL linebacker, he has to block the weakside defensive end. 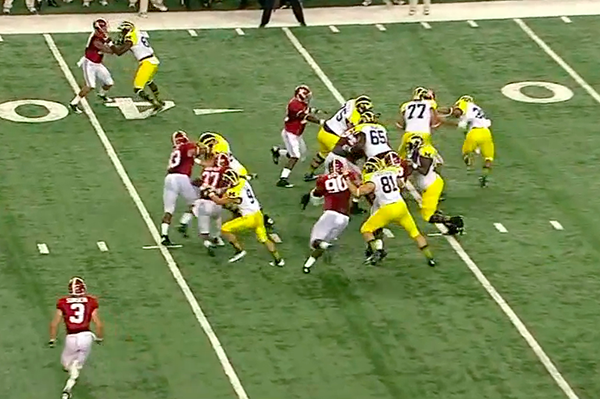 Lewan engages the defensive end who is quickly heading upfield. Rawls has to cut the ball back inside where the WILL linebacker is waiting or try to get to the edge still. 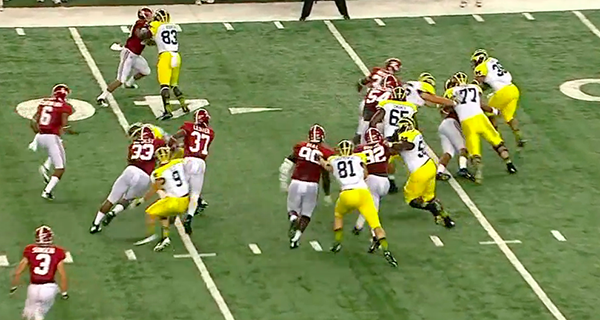 This is one of a number of examples of Schofield struggling in run blocking. His performance against the run is something to watch as the season wears on. While playing primarily on the inside of the offensive line last year, Schofield spent a lot of time doubling defensive tackles with David Molk. In our first view of him on the outside, he allowed defensive ends to rush by him and struggled to uphold blocks one-on-one. Caveats for opposition apply, but this is not a very positive first impression of the team's new right tackle. Great post. I'd just add that - even if Smith was 6'2 220, you're not going to be successful if the blocking fails. That kind of size helps you finish strong (get the extra yard or two), but if the blocking isn't there, you're better off being small. Rawls should still be able to get under the DE and if Lewan ignores him and gets the WLB there is a chance that Rawls gets decent yards. Even if the DE makes a great play diving back to the inside, rawls should be able to fall dive forward for 1-2. Some of the blame here falls on Rawls inside.. no, outside... no, inside... no, outside decision making. Needs to turn up and go.